A reading session of artist/author/journalist/activist/icon Jordannah Elizabeth; press photo courtesy of Publik / Private. Jordannah Elizabeth hardly needs any introduction. 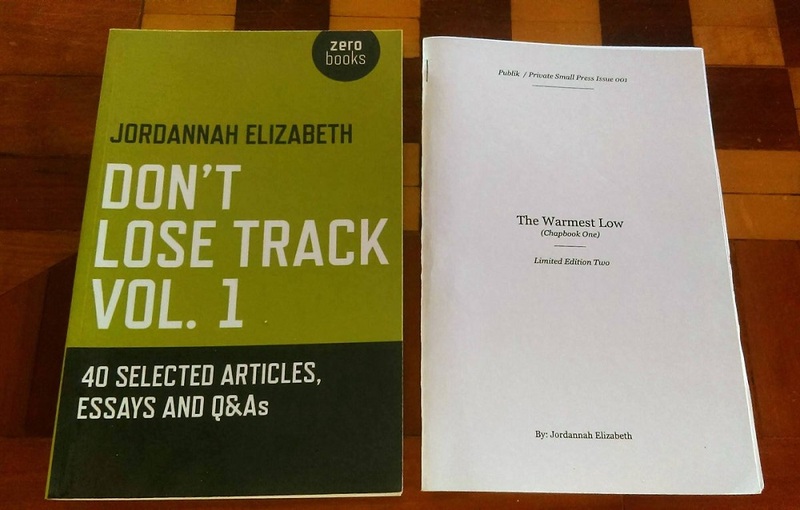 Based out of Baltimore, Elizabeth’s work has been published across myriad media outlets, magazines, newspapers, through her own independent publishing house Publik / Private Small Press and more. Known for works found in New York Amsterdam News, NPR Music, Village Voice, LA Weekly, MTV World, O Magazine, Cosmopolitan, DownBeat Magazine and other publications. Beyond the journal circuits Jordannah has been an advocate for the underrepresented global/local voices and talents, brokering larger conversations and coverage that advance intersectional arts to new enlightened echelons of inclusiveness. And even in the busy midst of all these disciplines, Jordannah Elizabeth continues to record her own works sharing listen to her Matt Fowle collaboration “A Rush (C Side Duet)”, a candid interview along with an excerpt from The Warmest Low. “A Rush” features Jordannah and Matt singing a rusting song that strums forward with a sense of spontaneity and honesty. Improvised meditations on rushes to the head and heart illustrate an organic take on the human experience. The lo-fi style sound creates a sense of intimacy like the joy of discovering a demo on a forgotten cassette tape where the warmth of the stripped down sound makes it feel as if you were in the room with the artists. The minimalism of the acoustic guitar that accompanies Elizabeth and Fowle’s vocals makes for a candle lit glow cadence as the song sweetly rocks like a lullaby centered around how our connections with others affects our spirits and faculties of sentimentality. Reflections on the memories and creative conceptions of the Matt Fowle duet "A Rush" that you discovered via your archives. The recording was an improvised bedroom recording done in San Francisco. I already had the concept of the song, “A Rush,” which became the title of an album I recorded with producer and artist, Breck Omar Brunson. But since I am a singer/songwriter, the song was written as a solo piece on acoustic guitar. Matt and I took the hook and improvised the verses. It was just a fun impromptu song. I had been experimenting with male vocal duets since about 2007. You’ll even hear on my latest album, The Warmest Low, that there’s a duet with Dave Heumann of Arbouretum. I think after a decade, I’d like to experiment with recording with female identified musicians, but I always liked the contrast of male/female—forgive the binary description—voices. I loved when duets between Ella Fitzgerald and Frank Sinatra and Frank’s daughter, Nancy Sinatra and Lee Hazlewood and others [that] came together to make quirky songs. Notes and streams of consciousness on the processes of compiling The Warmest Low. This book just flowed out. It was very natural. It was something I needed to write before I moved on to Chapbook Two. This is an accompaniment to Chapbook One, it was a retrospection and a way to give more understanding of what I had written myself and my readers. I did a soft reading of the The Deep Blue Sea and people really resonated with it. I felt very blessed and understood. Thoughts on the reckoning and realizations that occur in chapters I-VII. Being born in Baltimore in 1986 write when the crack epidemic hit in many urban communities like Baltimore, DC, Oakland and New York City is very significant as a Black person. It was a defining moment in my African American community and I think about why the Universe dropped in the world, during that time, in such a misunderstood urban town is something that’s always been interesting. Why then, why there? I could have been born in India in the 1950s or Kenya in the 1800s or Egypt in the 2010. It goes along the lines of examination of birth, death and reincarnation—whether I truly believe in it or not—I had a dream in Chapbook One that forced me to examine it. I also love the history of Baltimore, a place where Frederick Douglass and Harriet Tubman escaped slavery. So I start with talking about Maryland being a confederate state. I think a lot about the eeriness of Baltimore because of the gray, hazy days in the spring and fall, which reminds me of the writing of Edgar Allan Poe. Whenever I think about the ghosts of slaves and confederate ancestors of current Baltimore, even though Poe didn’t—to my knowledge—directly write about it, I always thought about his accurate description of mysteriousness of the city. Poe himself died on the sidewalk in Baltimore, where his grave lies, near where my family migrated from the south, it just brings a lot of thoughts and realizations. Baltimore also where Philip Glass, Frank Zappa and Thurgood Marshall were born. So, there’s a lot of genius across color lines that emerged from this city. This is a reckoning of finally getting to express about my connection and understanding of the history and geographical form of my hometown. It was a pleasure to write. The connection on how everything from the personal to historical events informs your own poetic prose, both fiction and non-fiction. Deep Blue Sea is a complimentary chapbook to my first chapbook, The Warmest Low (Chapbook One) Limited Edition Two. The whole title of the book is The Warmest Low Reader: The Deep Blue Sea. After being about to step back from Chapbook One for some time, I really started to think about what was going on around me in Baltimore and what my hometown truly is to me in a literary sense. Maryland is one of the first 13 original colonies. I think often about the history, the ghostly, eerie energetic presence—think Edgar Allan Poe—in such an old town. I think about the slaves who died there and the geological/ecological uniqueness of the city—how people had to build around its hills and waters, which is why I called it The Deep Blue Sea, which applies to the Chesapeake Bay that flows out into the Atlantic Ocean. Of course, these are not seas, but the name just came to me. The Warmest Low was about the weather. 2015 was one of the warmest winters we had had in many years. Knowing a little about my hometown, I refer to seeing a monarch butterfly in December in Chapbook One, which perplexed me and subconsciously figured the butterfly hadn’t migrated because it was so warm. I wanted to look more into entomology—the study of insects—and the connection to the climate in The Deep Blue Sea...I just got had a chance to step out of the esoteric, existential and emotional aspects of Chapbook One and look at my story a little more logically. I think it gives the first chapbook grounding and context. Jordannah answers questions about Deep Blue Sea with writer, Tracy Dimond; courtesy of Jordannah Elizabeth. Takeaways from the experience of organizing and creating The Warmest Low: The Deep Blue Sea. Baltimore writer and editor, Lauren H. Smith helped me edit the book and she assisted me in making it flow very well. I’m so happy to have worked on it with her. She was so smart and she got it. I could not have done it without her. Shout out to Michael Martino for editing Chapbook One...but Lauren really kind of helped me see what needed, what could be expanded upon and what could be discarded. Challenges and triumphs as a woman of color working in the creative economies of various art mediums (music, journalism, literature, et al.). I’m lucky. Yes, I work really, really hard but being able to write for a living and being published in top tier publications only after five or six years of writing professionally makes me feel really blessed. It also makes me work to open doors for other Black writers. I wrote a manifesto called Black Voices in Music Criticism Are Essential for East Bay Express which expanded to a panel discussion with Greg Tate, the grandfather of hip hop journalism (Papa Tate) and jazz scholar, Regina Braggs was amazing. I also write about and teach writing workshops and lecture as much as I can to inspire others succeed if they truly love writing. The Black writer’s community in any sector, non-fiction, fiction, journalism, editing, creative writing is very small. I hope to see it grow, because it can be quite lonely. But I certainly give homage to those who have come before me and who are colleagues now. I think young Black kids from places like Baltimore, Oakland, Chicago and other places deserve hardworking role models. But I’m honestly, just living my dream and doing what I love. I don’t take it for granted and never will, that’s why I work so hard to do my best. I don’t want to compete, I don’t try to be the best, I don’t work five times harder to get half of what white writers get. I’m just in love with my job. Notes on how your touring travels have informed your own evolving arts. Touring was hard. I think I have health issues because I toured America and the world non-stop for ten years. There were times where I actually starved. Not many people in America know what an actual hunger pain feels like, but as I kept going, I was able to begin to get paid well, bring people together and put on good shows. Shout out to all my collaborators and band members. Great things that are happening currently in Baltimore. I mean, I see growth and try to contribute to helping the community build more imaginative and bigger lives for themselves. But I am privileged. I don’t live in East and West Baltimore where kids are dodging bullets every day and are so poor they didn’t have lights or water in their house for two years. I try to connect, but it’s harder for certain parts of the community to really connect with me. They think I’m rich and from another city. They don’t know I didn’t come from money, I still don’t have a lot, but they see my nice clothes, accessories and they ways I speak and think I don’t get them, but I was born here, I get the struggle and I hope I can get that across to them more. I work with, connect with, teach and mentor who I can, no matter their age, race or economic status. It’s about working with people who are hungry and want to become professional writers. All the things that have you hopeful about 2019. I am trying to build a bit more independence for myself. I’ve been sick for a couple of years and gave a lot to my family, friends and others. I want to zoom into my writing more. I want to put more books out and I want to love myself more. My relationship with my mind, spirituality and body are things I’m taking initiative to really work on — I have been working on building a good medical support system and have great friends who believe in me, so no matter what happens, I just want to focus more on becoming a whole person. Jordannah Elizabeth’s Don’t Lose Track Vol. 1 and The Warmest Low; courtesy of Publik / Private. In my mind, the interesting thing about The Warmest Low is that nothing about it was planned. It was born out of a series of simple conversations, but the weather was the initial catalyst for the title. The spark of the idea for The Warmest Low series derived when the vague, yet loving (in their own way), antagonist announced after just waking up, “The weatherman said it’s going to be the warmest low today,” meaning that in December 2015, a record was set for having the warmest low temperature in many years. After doing some research, and reflecting on the continuation of this series and how to move forward from The Warmest Low (Chapbook One), I realized that the warmer temperatures were why I saw a full-adult monarch butterfly flying around in the city in the middle of winter — the encounter I wrote about in the first chapbook. Not being a meteorologist, I couldn’t believe that an adult butterfly could survive in December, no matter the weather. Most monarchs migrate in the winter to warmer areas like central Mexico, beginning their migration from northeastern areas in Canada and the United States in September and October. I used to raise butterflies and moths as a little girl. My brothers and I would choose a caterpillar and put it in a jar with plenty of sugar, and watch it grow into its full adult stage. Then, we would release it to live outside in its natural environment. So, I had a little bit of experience with the insects, making the butterfly's appearance feel like a mystical omen, along with an environmental anomaly. My confusion came from an odd mix of meteorological inexperience and my novice understanding of etymology. In having time to look back on a piece of writing like (Chapbook One), which was so ethereal, mystical and disorienting to me when I was writing it, I began to realize that there were also very logical connections to be made in regard to story. Now, three years later, after a whirlwind of touring and the first book of the series becoming a bit aged and settled in, I obtained some perspective, and I wanted to take the time to look at the hidden historical gems of (Chapbook One) before I move on with the mystical tone of this series in (Chapbook Two) and beyond. This is my reason for creating Reader. Don’t get me wrong — I truly respect where my mind was at that point in time when I was writing the booklet. And it won’t be hard to jump back into the unique tone of the story as the series forges ahead. So, what do I know? Maybe I’m just the same, but I will reiterate that there are some historical, geological, meteorological perceptions I felt I had to explore. They have become an important layer to the story I needed to share. My relationship with my surroundings is very important to me, even more so as I grow older and more aware. The creation of The Warmest Low (Art Basel Edition), an out-of-print seed and raw prototype of this series, was driven by emotion, and by an invitation to present a piece of artwork at Art Basel in Miami, FL. It was the last stop on an eight-month international tour I embarked on in 2016. Because of exhaustion, I never actually made it to the prestigious arts festival. When I returned home from the tour in December 2016, I hurried to edit another edition of The Warmest Low, hence the importance of adding “(Chapbook One) Limited Edition Two” to the title of the first book. I worked on (Chapbook One) with the help of editor Michael Martino, and very small runs of the (Art Basel Edition) in its original form and (Chapbook One) were printed, bound by my own hands, and released through Publik / Private Small Press, a boutique press I created just to release The Warmest Low series on my own terms, completely DIY. Both books were premiered at the Publications and Multiples Fair in Baltimore at The Baltimore Design School on April 1, 2017. Red Emma’s Bookstore took me on and made the books available at their booth. To my surprise, the book sold out in an hour. They continued to sell well locally for a number of months. The reason why this Reader is called The Deep Blue Sea is simply because of my adoration for the Chesapeake Bay. It’s a body of water that is far from perfect, but it is beautiful in its own way, just the way life is. I think we’re all caught up. I hope you enjoy The Warmest Low Reader: The Deep Blue Sea.